I love taking peeks at others people bags, I don't know why but it's so interesting to see what they carry with them everyday. Maybe it has something to do with the fact that when I was little my mom and grandma made a rule that I can't rummage their bags. Haha. It's so funny to remember that once I was a person who always carried the biggest purse I could find and now I don't have a problem to go out with a baby bag! Yes, baby bag! This is my bag when I'm running around and these are the things I always have with myself. If I'm going to the uni, I will carry a tote bag with me so I can bring with me my art supplies or notebooks, but that's it. Michael Kors wallet - Maybe a year ago, I found this wallet. I had a problem because all of the wallets I owned were too big for my purses and I was constantly caring my cash and IDs in bags and I ended up losing my ID. That was the warning that I really need to find the smallest wallet. I was lucky enough to find this one at Shopbop. 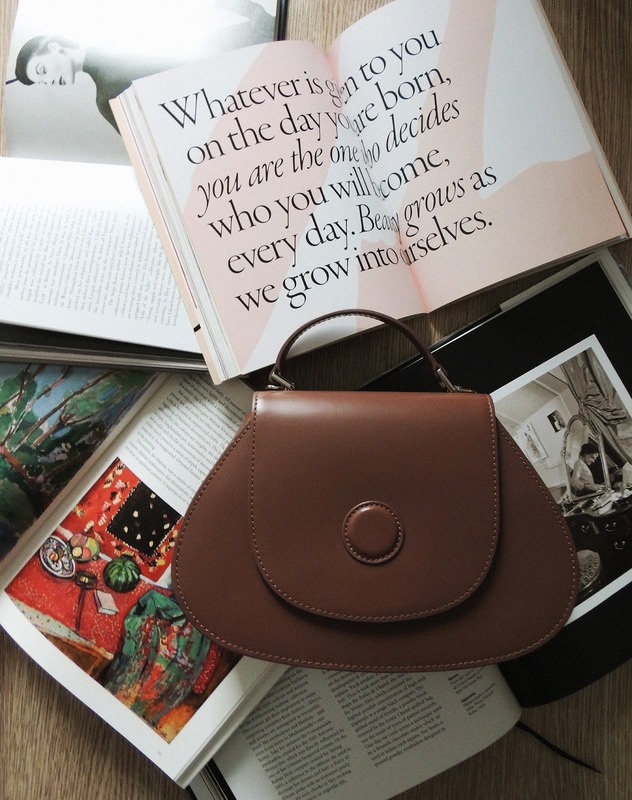 I really love it, it's small, practical and the quality of the leather is really good. Cardholder - I was in a search for a cute card holder and I couldn't find the one that I like and just when I stopped looking for it, this one fell from the sky, literally! I love it, the quality is good and all of my cards fit perfectly. 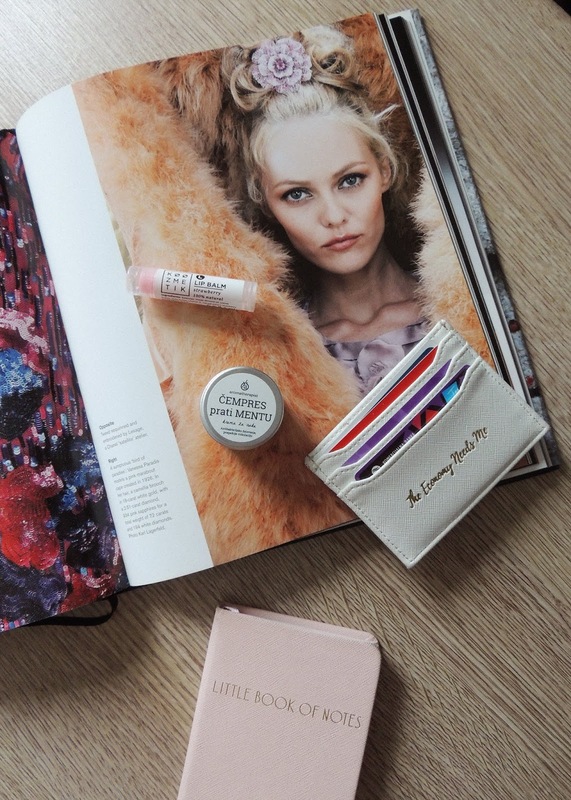 One of the things that I always carry with me is lip balm and hand cream! Right now I'm using Koozmetik Lip balm from Strawberry. This is a Serbian brand and it's natural and handmade. I really like everything about this brand, from their products, ingredients to it's design. I love this lip balm!I struggled to fine one that really works. I realized that only natural lip balms work for me. This one is the best one so far, it really nourishes and hydrates my lips and it's protecting them from cold and dry air. Aromatherapist hand cream the original and literal translate of this cream is 'Cypress follows Peppermint'. I have really bad skin during the winter. My hand get dry and I have eczema on some parts. This cream nourishes my skin and it get's absorbed fast and the small is so good! It's so refreshing and raw, I love it. One more thing that I appreciate about this cream is that it's antibacterial because it has peppermint in it. And let's talk about packaging and design! It's so cute and practical. I forgot to mention it, it's as well a Serbian brand. I'm so proud and happy that we have so many natural skin care brands that are worth mentioning. One of the things I always have with me is notebook/planner. I really enjoy writing and planning things. I like to having notebook by my side, so when idea comes to me, I can write it down or when I want to plan something, I can do it. I genuinely love writing and I really can't get used to do it on the phone. So, as long as I'm asking I'll always have notebook or planner by my side. Hand sanitizer is something I always have in my purse. This one is from Bath & Body Works and I really like it. It's much more different from the ones I got here in Serbia. It's not stinky and tacky and it smells so good. It reminds me of the smell of the sun screen creams and it leaves hand kind of hydrated. Last but not least are liquid lipstick and lip-liner. These ones I wear on daily basis and i can't live without them. The liquid lipstick is Golden Rose in shade 17. This is Serbian brand as well and they have the best drugstore liquid matte lipsticks. I love wearing this shade everyday. I tone it down a bit with Essence lip-liner in shade 9. Ja nosim sve uglavnom u rancu :D I to povećem :D Pa na kraju dana kukam od bolova maltene. I ja imam tu foru kada idem na faks - knjige i sveske potrpam u ceger a nosim babybag. Jooj verujem, nije bas prijatno.